Return / Exchange Policy w/ NO restocking fees. You have 30 days from receipt of your order to make a return or exchange. Items returned or exchanged must be new, unworn, unwashed, without embroidery or customization. The customer is responsible for the cost of return shipping, unless our company is at fault. We reserve the right to charge a restocking fee of up to 20%. Order Cancellations; orders which have already reached our distribution center cannot be canceled, changed or stopped. All cancellations require confirmation by customer service representative. Policies are subject to change without notice. Simply download the return form and follow the instructions to return the item or items to the address listed on form at your expense. *Shipping charges are not refundable. Embroidered, Washed, or Altered items are not returnable, exchangeable, unless our company is at fault. Customer is responsible for the cost of returning items back to us for processing. Option #1 Simply download the exchange form and follow the instructions to return the item or items to the address on form at your expense. Your exchange will be returned to you at our cost. Option #2 For faster service on exchanges, we recommend you re-order online or by phone the correct item or items. Download the return form and follow the instructions to return the item or items to the address listed on form at your expense. *Once received we will refund your purchase, less shipping charges. Your refund will be credited back to the source of payment. *Shipping charges are not refundable. Embroidered, Washed, or Altered items are not returnable, exchangeable, or refundable unless our company is at fault. 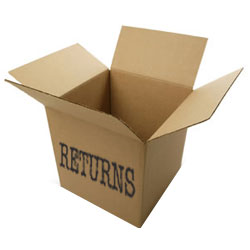 Customer is responsible for the cost of returning items back to us for processing. Customer RK# ______________ (Located on packing slip at top). We highly recommend that you send your return via UPS, Fed EX, or insured US Mail. Items sent but not received by American Work Apparel will NOT receive credit for the return.